Intoxicated by the bad air, they danced frantically. After a while, Lapinette became exhausted and knelt by the wall. Cries urged her on and she raised one paw in reply. Wabsworth felt his walkie talkie vibrate. At first he thought it was part of the tune, but it activated a safety circuit and he ground to a halt. "Stop the Dance, Commander!" he yelled. 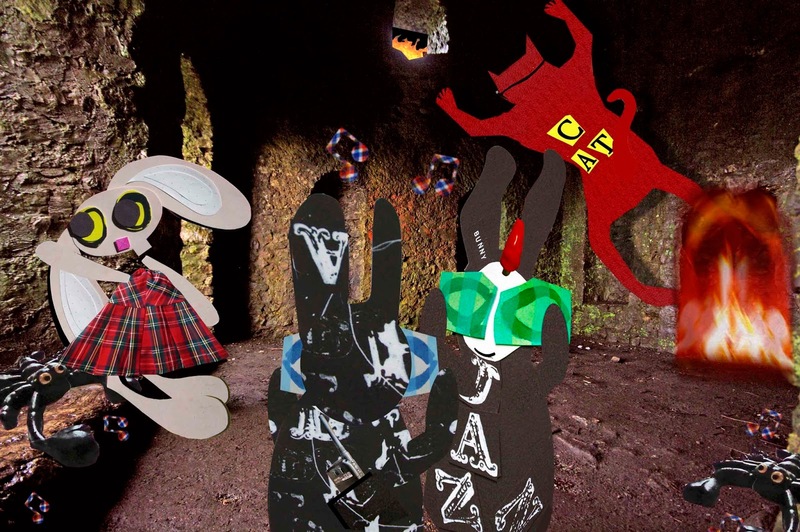 "I can't," replied the Wabbit. Wabsworth kicked the Wabbit's legs from under him and he sank to the floor. "Gotta dance," he murmured. "It's a trick," said Wabsworth. The Wabbit shook his head several times and hit his ear with a paw. "Still in Hallowe'en," he sighed. He looked at Lapinette, then shook her. "I was watching the funny little creatures," she murmured. The Wabbit prodded her sharply. With a look of horror, she leapt to her feet and kicked the black beast that had crawled from the wall. It vanished into a crack and the music began to fade. "There's more," yelled Skratch. He bounded across the hearth and up towards the window. "We have trouble," he meaowed. Flames crawled and crackled around the small aperture and things inside got hotter. The Wabbit heard the radio whine and he glared at Wabsworth. "Who's on radio duty?" Wabsworth took the radio and spoke into it gently. "Duty Operator? Identify." "Transmettitore Zero Dark," replied a voice. "Temporal emergency," snapped Wabsworth. "Protocol H .."